When I think about my goals as a teacher, character education has always been at the top of my list. I get just as excited when my students greet other teachers by name, hold doors open for adults, and show a true sense of appreciation as when they master their multiplication facts. I believe that intelligence and character must be intertwined, and that the classroom is the perfect place to develop this. I try to integrate character education into all subjects that I teach, however I have found that it lends itself perfectly to Language Arts. There are so many wonderful children’s books that teach important values and lessons. One way that I infuse character education is discussing the theme, or “THE MEssage” of the stories we read. We talk about what the author is trying to tell us through the character’s thoughts, words, or actions. We also talk about how someone’s opinion of the theme for a story may be different from someone else’s. Many times there are multiple messages hidden in a story, and each person will pick up on a theme that speaks the most to them. After reading a story, we will have one student read to us some of the previous themes we have determined as a class. Then the students can raise their hands and tell the rest of the class which theme stood out to them the most for that particular story and why. After everyone who wants to share has shared, then we take a class vote on which theme most of the students thought fit with that book. I make sure to stress that there is no “right” or “wrong” theme, we are just picking the one that most students see fit. Then we put a picture of the book up under that theme. This is one of my all-time favorite books and favorite character traits to teach! In this lovely Hawaiian story, Koa, along with all the other local boys, is given a seed to grow to determine who will take over to be the next leader of the village. Koa does everything he can, but his seed will not grow. When the time comes to present their seeds to the current leader, Koa sees all the other boys have grown beautiful plants, and he is embarrassed that he has nothing but his seed. When Koa shows his seed to the leader, he finds out that all the seeds that were given out were dead, and Koa was the only boy who had integrity, and was therefore chosen to be the future leader. We talk about the lesson we learn from Koa, and how it is always important to do the right thing, even if no one is watching. LOVE this book and it has an amazing impact! 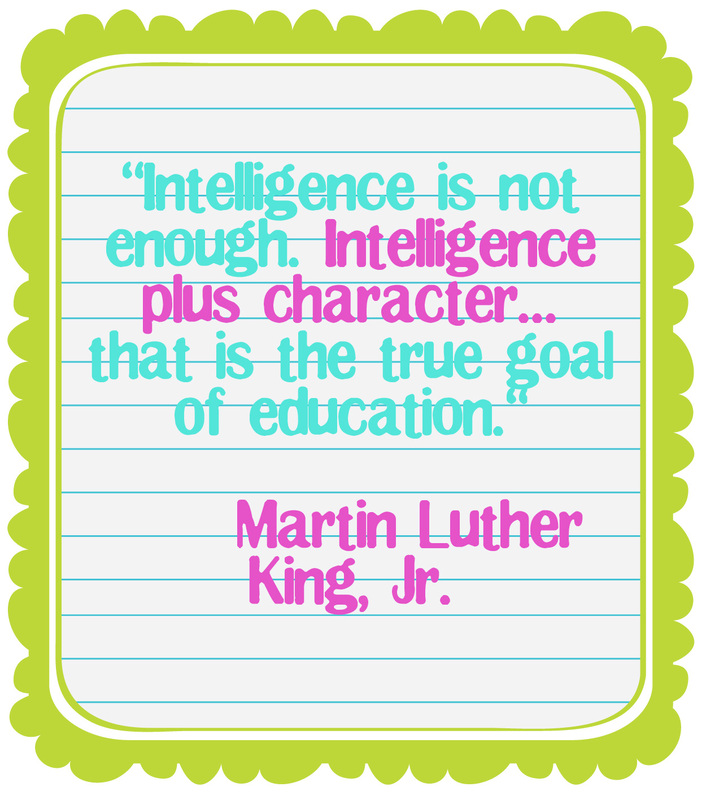 Character education can also easily be tied into the Common Core standards. Here are a couple of the 4th grade standards that we address when we discuss and analyze these books in my class. No matter what grade level you teach though, you can always find a way to relate character education to the standards! 4.RL.2 Determine a theme of a story, drama, or poem from details in the text: summarize the text. To print the theme posters that we use in my class that were created by Beth Newingham, you can go to this Scholastic site. They are listed under #5: Finding Common Themes in Fiction Texts. What books to you use to teach good character? I would love to add to my list! GREAT books! I am saving this post for later use! Thanks for the great suggestions Molly! Thanks for the suggestions! I also love The Honest to Goodness Truth for talking about honesty. What a wonderful post – thank you SO much for creating an awareness of how to infuse character education into your literature lessons. I love SO many of the books you posted… the ones I have read are SO meaningful and helped make a difference with a lot of students I taught – the last one I read was The Butterfly, and one of my students is Jewish and it really touched her.. reading books like these helps all my kiddos to connect with one another. I am so excited to find you! We have a lot in common – favorite color, yellow lab (mine is 12 years old), writing/reading notebooks and more. I look forward to following your blog. I am a new blogger myself – check me out sometime! Great post! A Bad Case of the Stripes is a class favorite! Also, when you have a chance, come on over to my blog. You've been tagged! Just pinned this for TBA!